Texas Attorney General Ken Paxton is launching an investigation into whether or not a corporation that peddles fried chicken partially in order to fund an anti-LGBT agenda has a constitutional right to set up shop in a San Antonio airport because that’s where we are right now in the annals of history. 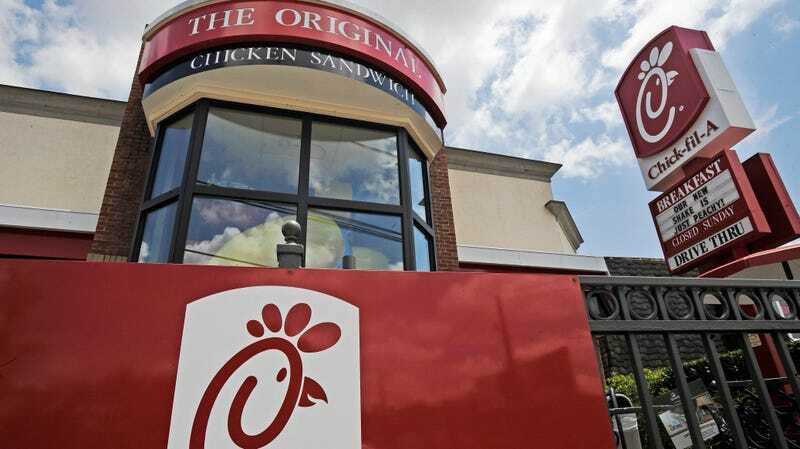 He is referring to the city’s 6-4 vote last week to keep the fast-food chain out of the airport due to its “legacy of anti-LGBTQ behavior.” Chick-fil-A’s corporate statement explains that they sell fried chicken nuggets and waffle-cut potatoes “to glorify God by being a faithful steward of all that is entrusted to us and to have a positive influence on all who come into contact with Chick-fil-A,” which makes their discrimination a matter of religion. They’re also closed on Sundays because, as everyone knows, the Bible prohibits the dipping of wingéd beasts into honey mustard on the Sabbath. In a news release on Thursday, Paxton argued that since the airport receives federal funding, prohibiting Chick-fil-A from earning money that will be used for discrimination is also discriminatory. My head hurts.